Picking dandelions will stain your finger tips and nails and although this will be removed from your skin within a couple of washes, the nails can take a bit longer. One way of reducing this is to dig your nails into a bar of soap and wipe off the excess before going to harvest your dandelions. If you intend to use your dandelions for food, remedies, brewing etc avoid harvesting them from the roadside where they will have absorbed excess amounts of heavy metals from car fumes. Also avoid the main parts of your lawn unless you know they haven't been trampled on or peed on by pet dogs, and from the corners of garden walls where they may have been sprayed on by the local tom cat. If you are using your dandelions to dye yarn, fleece etc the above point is not important so use the possibly contaminated ones for this purpose. Choose a dry sunny day to harvest your flowers, the sun will encourage more flowers to open, and being dry before harvesting means less chance of spoiling your recipe, especially if infusing in oil for remedies. Also it is best to finish harvesting before mid afternoon as the flowers will begin to close up for the day making them harder to pick. It used to take me ages to harvest enough petals for a batch of wine, as I would pull a load of flower heads off before sitting down in the sun and one by one pick all the green backs off the petals to go in the compost, it took twice as long as the way I do it now, plus my hands would be a mess for days. 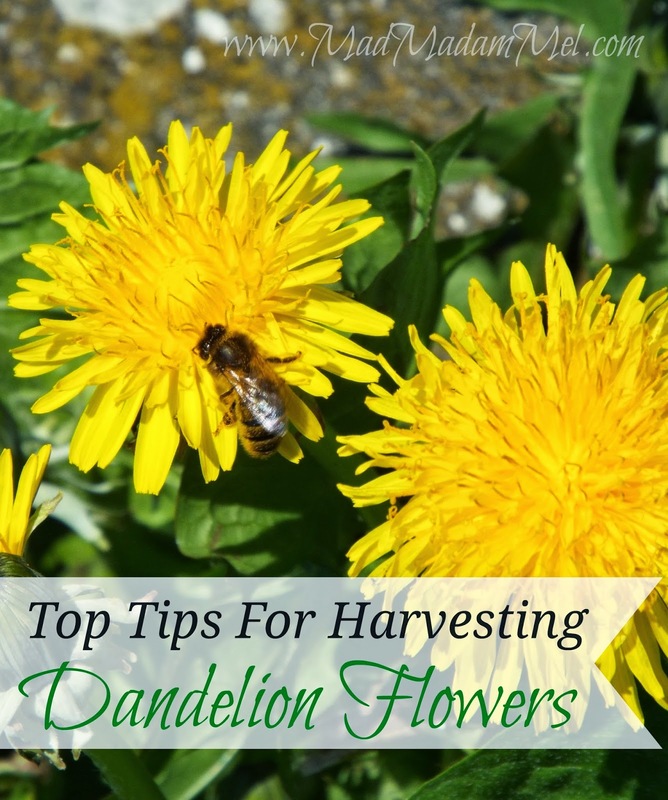 First grab your dandelion flower head by the green part at the back tightly, pinch together all of the petals in the fingers in the other hand, then firmly pull out the yellow petals, if a few bits of green sneak in it wont matter. When you have done this a couple of times you can work really quickly filling your measuring jug. If there is any little bugs or flies on the flower head, just gently bend over the stalk and tap them out. When measuring your flower petals for a recipe, firmly press them down in your jug, but not so hard that the are tightly rammed in. So tell me what is your favorite use is for the humble dandelion? This morning dawned and so ended an era, our old ex-battery chicken 'Scruff' had passed away in the night. We knew the day was coming soon, she had taken to spending most of her time sleeping in the sun and long lie-ins in the mornings, though she was still sprightly enough when treats were offered. She originally came to us through a friend of John's at work who had several ex battery chickens, along with a few of her friends, this was many years ago when we were still living in Derbyshire. The other ladies passed on before we moved here so only Scruff (so called as she was the scraggiest, scrawniest bottom of the pecking order one) remained to make the long journey North. Being on her own for a time before the move she made friends with one of the local Blackbirds and they would peck around in the back garden together. I will never forget the day I looked out of the patio doors and saw what I thought was a dead chook and blackbird lying on the lawn, but was instead the pair of the sunbathing together, yes she had taught a blackbird to sprawl out on the lawn, legs and wings everywhere to sunbathe. Making the move north with John in the van, riding happily in the cat carrier on the passenger seat all the way, taking a break at Inverness services to stretch her legs and have a scratch in the woodland car park before further north and a ferry ride. She soon settled into her new life with much more land to roam and it makes us happy to know she had a good life here with us. She leaves behind her companion 'Scrit' who although seemed unhappy this morning, seems to have made a new friend in one of the new chooks that keeps escaping from the run. 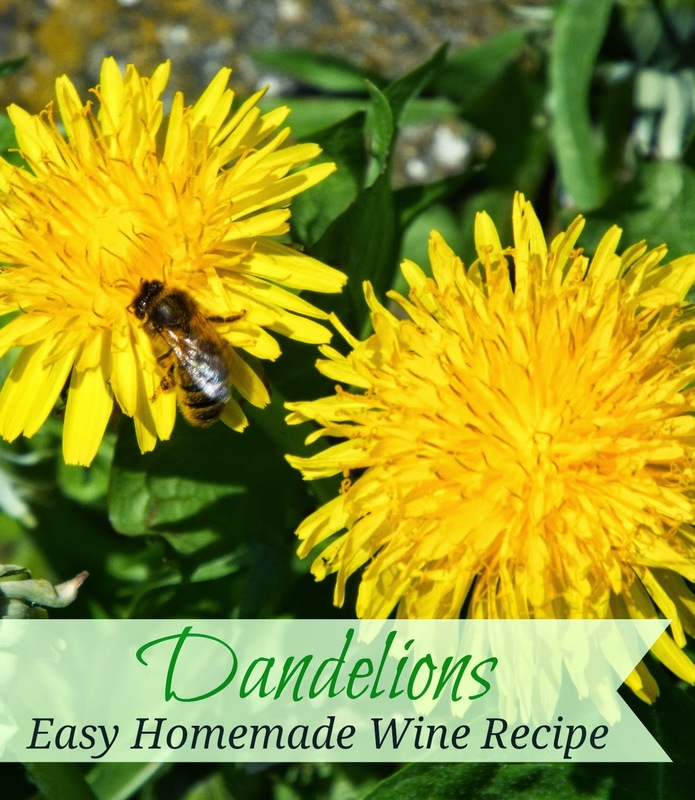 The Dandelion season is in full swing right now and the first big flush of flowers ends up fermented. This year I am experienting with a new Mead recipe I've made but until it has been tested I will keep that one in my notebook. 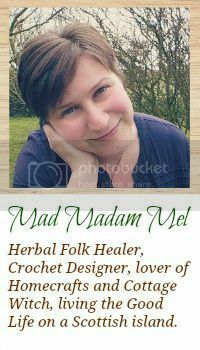 Our usual recipe, and the one we used for the wine at our own Handfasting, comes from one of my favourite wild food books for uses in the kitchen. Harvest and measure 2 pints of dandelion petals discarding the green backs of the flower heads. Place the petals in a large container or pan with a tight fitting lid, then pour over 2 litres (1/2 gallon) of boiling water. Cover and leave to stand for 3 days. After the petals have had their steeping time, strain through a sieve and add the liquid to your demijohn along with the jest and juice of the 2 oranges, a large funnel helps with this. Add the yeast to a cup half filled with warm previously boiled water and a teaspoon of the sugar and stir, in a few minutes it will begin to froth, stir again and add to the demijohn. In a jug place half the sugar and dissolve with boiling water, allow this to cool down till it it just warm before adding to the demijohn, repeat with the remaining sugar. Give it all a swirl and your done. Add the airlock half filled with water, then a small cotton wool ball to the top of the airlock to keep flies out. Put away somewhere to forget about for the next few months. In around a year it should be ready for bottling. (This post contains affiliate links which help me run my blog and contribute to our family. For more info on affiliate links click here. 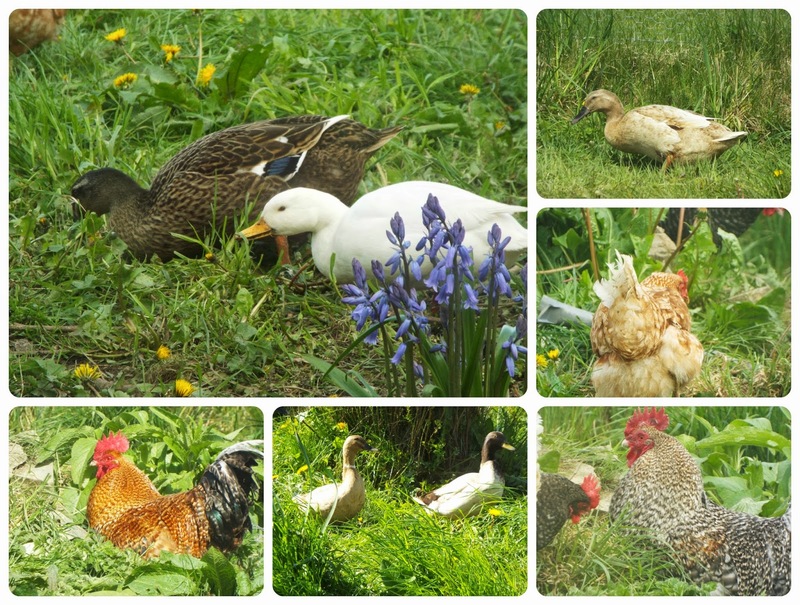 Top left we have Charlie Drake (the cute little white cartoon duck) smallest and ruler of the flock, with his missus Jemima (head female duck). Charlie and our other drake seem to have no problem sharing their harem except when it comes to Jemima, she is his Lady :) and Charlie puts him in his place damn quick even though he is half his size. Bottom left we have our second in command and kept in his place Rhode Island Red. Big Red as he is called, apparently was a bit of a piece of work until having an incident with a car, now he has a limp and comes second place to his older more laid back commander. Bottom middle we have Curly with one of the younger ladies of the flock. Curly's tail feathers have this adorable way of curling up, he can get quite boorish when it comes to feeding time and is rather bossy with the ladies, but bows down to Charlie's command. Bottom right we have Mr and Mrs Maran. Mrs Maran is top of the ladies pecking order but is laid back and doesn't seem to need to enforce her place much, and it is rare if she is not by her hubby's side. Mr Maran is top chook, he is laid back with everyone, keeps Big Red in his place simply by chasing him every so often, other than the other evening when Red tried it on with Mrs Maran and he took exception. A brief fight later and the sparrows were happy with their fresh supply of nest feathers, and Mr Maran kept reminding Red who was in-charge for the next 24 hours. Top right we have one of our young lady ducks of which there is 7 not including the two drakes and Jemima. The only one named so far is our special needs duck Tilly. And the final picture on the middle right, is one of our new little red hens. There are 8 of these girls but only two have names, Mona who we have taken out of the run and homed with our 2 older chooks as she was getting severely picked on and is our depressed chook. We also have Peggy, so named due to her dodgy leg which means she has a limp, but she is actually the least flighty of all the birds and will come right up to you no problem. The past Four and a half years have gone so quickly since we moved here to the cottage, lots of changes endings and beginnings. One of those beginnings was the start of a new phase in mine and John's relationship when we (literally) tied the knot three years ago on our land with a Handfasting. A small group of family and friends joined us for a quiet simple ceremony in the garden performed by friends of ours who are registered pagan celebrants, making the whole thing legal and without a separate registry office event. This patch of land we are caretakers of already holds many memories for us, how many more will it hold in three, ten or twenty years from now? Sometimes when the wind is howling around the roof, or when it's so cold you need to light the woodburner in august, moving to a warmer location feels a blissful daydream; but we are now bound to this land, it is a part of us as we are a part of it, together Handfasted. The brighter half of the year is here at last, time to take down the winter drapes and cover the beds with summer linens. 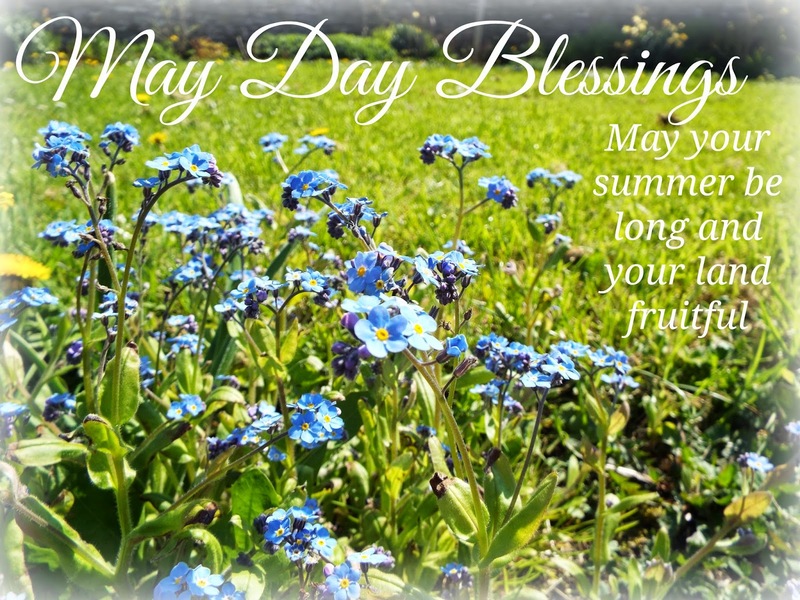 May day, or Beltane really does seem to make the beginning of the busy season on the smallholding, it is when foraging and harvesting really start for us. The dandelions are in full bloom this week, encouraged out by some of the glorious weather we had at the weekend. They really are such a wonderful and useful flower it seems almost shameful to call them weeds, but I admit they are very rampant (appropriate for a festival season of fertility). I will be sharing some of my favorite uses for them very soon. I even had some help for one of our two remaining chooks. The character above is the not so young anymore Scrit, and off camera is our rather old for an ex-battery hen Scruff, so named as she was such as mess when we got her 5 years ago, very old indeed for a hybrid.